Pictured left to right: Kevin Fall, Jason Nowakowski and Kevin Brinkman. 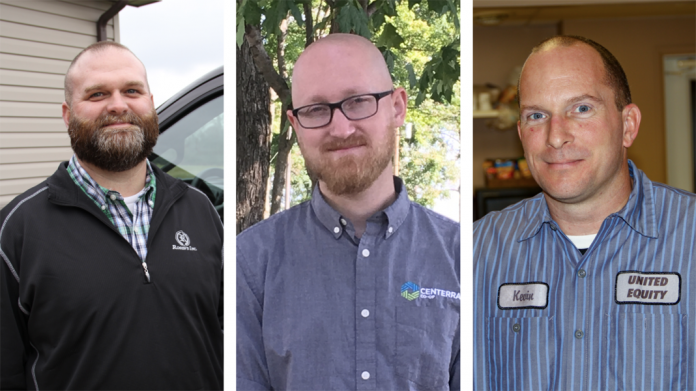 COLUMBUS — The Ohio AgriBusiness Association recently announced the recipients of the 2019 Industry Excellence Awards. The Excellence in Customer Service recipient is Kevin Brinkman, United Equity, Delphos. The Achievement as an Emerging Leader goes to Kevin Fall, Rosen’s, Middletown. Excellence in Safety and Stewardship went to Jason Nowakowski, Centerra Co-op, Ashland. Award recipients will be recognized at the OABA Industry Conference on Jan. 31. Winners will be recognized with a plaque and $1,000 cash award, sponsored by ABIS/J.H. Ward Agency and The Elliott Group. The Industry Excellence Awards honor excellence, professionalism and achievement among OABA member companies and their employees. The Excellence in Customer Service Award is presented to an individual who goes above and beyond in their service to customers, to help define what excellent customer service looks like, and honors those whose contributions may often go unnoticed. Brinkman, of Ft. Jennings, is head mechanic at United Equity, in Delphos, where he is responsible for all agronomy equipment at his facility, as well as seed treatment, nurse truck operations and much more. Although customer service is not in his job title, Brinkman frequently makes himself available to customers outside working hours to assist with equipment problems. The Achievement as an Emerging Leader Award is presented to an individual who represents the spirit of leadership as a growing agribusiness professional. Fall, of Middletown, is a seed treatment specialist for Rosen’s, where he seeks to help retail partners all across Ohio and Indiana better understand the value of emerging technology. By offering demonstrations, plots and research results, Fall carries out his personal philosophy that actions speak louder than words. The Excellence in Safety & Stewardship Award is presented to an individual who demonstrates safety and stewardship in day-to-day activities and interactions with customers, encouraging others to put safety first and be good stewards of equipment and land. Nowakowski, of Ashland, is safety and risk manager for Centerra Co-op, where he directs safety and environmental duties to reduce injuries and accidents for Centerra’s 35 branch locations. By involving employees from all areas of the company, he works to improve the overall culture of safety through collaborative, innovative solutions. Nowakowski takes it to the personal level of involving employees in the safety committees, said Jean Bratton, CEO of Centerra Co-op. The two-day Industry Conference, Jan. 31 Feb. 1, 2019, in Columbus, is filled with widely-respected speakers and industry professionals, sharing their expertise on a variety of topics relating to agronomy, grain and feed, safety and more. All-inclusive registration for the event covers admission to both days of educational programming, all meals, including the industry networking reception and dinner, and the OABA Annual Meeting. Registration fees are $275 for members ($350 after Jan. 15, 2019). Non-member registration is $425 ($500 after Jan. 15, 2019). Individual day and reception/dinner-only registrations are also available, as are exhibitor and sponsorship opportunities. Visit www.oaba.net/events_conference for more information and to register. Hotel accommodations for the Columbus Marriott Northwest can be made online by visiting www.oaba.net/events_conference or by calling 614-791-1000 and using the code Ohio AgriBusiness Association. The OABA hotel block reservation deadline is Jan. 15. Previous articleCan New Year's resolutions actually work?